Finished object: Stash piece no. 1: Mathilde. Mathilde blouse in black crepe de chine – such a lovely fabric to wear! I´ve finished my Mathilde! You know, that gorgeous blouse pattern Tilly just released. Before I say anything more, you should really read Karen´s post on this, as she captures my exact thoughts on this blouse much more eloquently than I could do myself. I love my new blouse, but I made it a little too small, though. I used my upper bust measurement instead of full bust, and didn´t make a FBA, because I thought the amount of ease didn´t make it necessary. In hindsight this was a bad idea, and for my next version (because there will be a next version) I will lower the bust dart and make a FBA to give it a better fit. Mathilde – back view. Don´t you just love the fullness of the sleeves? Still, this blouse fills a gap in my wardrobe for me, I needed a solid black, 3/4 sleeved top for work, and this fits the bill. I made it from a crepe de chine I bought at Rainbow Tekstil here in Oslo, and it´s very soft and light to the touch. My first button choice were some pretty black ones shaped like roses, but after placing and re-placing them I found them to be too heavy for the fabric. Also, as Karen in the aforementioned post suggests, slim, flat buttons are better for a back closure. 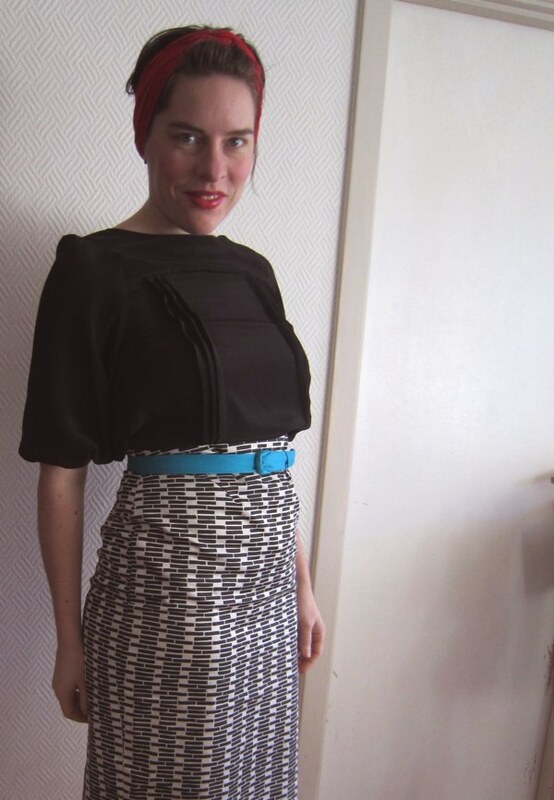 I thought I´d lost this belt in the move – but I found it together with my (neglected) jewelry! Gorgeous! I love how you styled it! This is gorgeous! I’m working on mine at the minute, and I love how your’s looks tucked into a skirt. I didn’t think of it as a “tuck in” top, so I’ll have to remember that. Very pretty! I love the whole outfit you put together. Oh Solvi, it’s gorgeous! Looks so elegant in black, and I LOVE the way you’ve styled it. Lovely blouse! I love your outfit, with the colourful accents! Oh, now I want one in black too! This is absolutely gorgeous, so sophisticated. Good job. 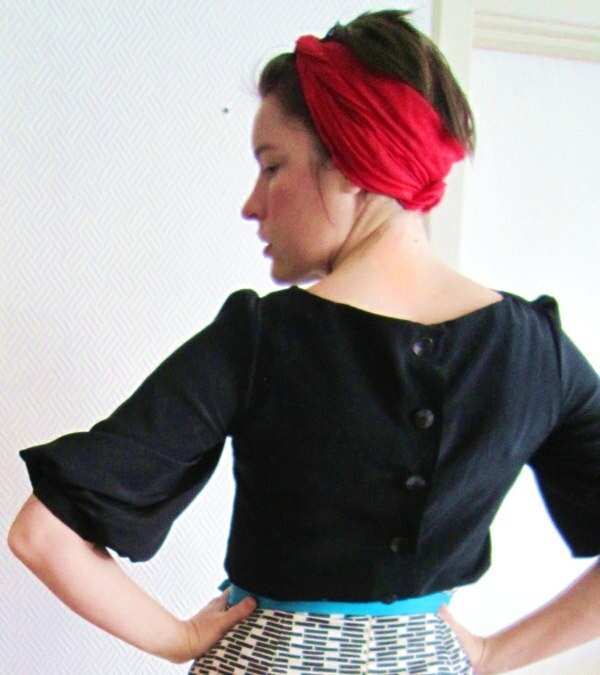 Beautiful version of Mathilde, and gorgeous outfit and styling. Stunning!